Data Smackdown is Back at Northwestern University - Enova International, Inc.
Enova will be returning to Northwestern University on November 13th to challenge students with the 4th annual data analytics competition — a.k.a. Data Smackdown. The campus event allows teams of future analysts to compete for cash prizes. The event will start at 6:00 p.m. and is expected to last until 11:00 p.m. Teams of 1 to 4 people will compete against each other, analyzing a data set in a business case. Be sure to bring a laptop, power cords and your student ID. And don’t worry about food; dinner is on Enova. After check-in, the rules of the Smackdown will be defined, and each team of one to four people will be presented with a data set in a business case. You and your team (1-4 team members) will work to analyze the data and make recommendations. Work must be finished within the room to remain in the competition. At the end of the evening, prizes will be awarded to 1st, 2nd and 3rd place. New to data analysis? 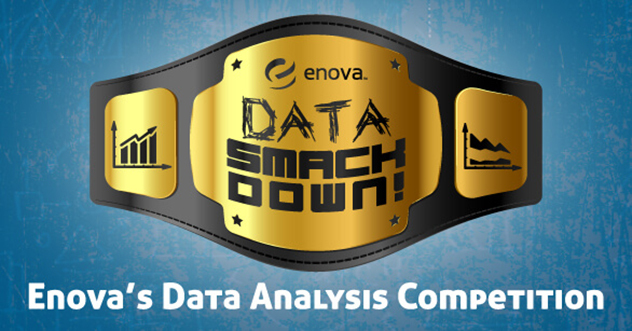 The Data Smackdown features a “Beginner Team,” led by veteran Enova analysts. This is an option for people who want to learn the basics of data analysis, so they can have the skills to compete in future competitions. They will talk you through the basics of approaching the problem and help you through the analysis. While the Beginner Team will not be eligible for prizes, they will leave the event with more analytics knowledge.